Vergelegen Guest House and Restaurant, surrounded by lush green vineyards of local farmers, sits nestled in the Orange River valley; on the out skirts of Kakamas, Northern Cape. Vergelegen is en-route to various popular destinations: Augrabies National Park, the Kalahari, Namibia, Richtersveld and the West Coast. 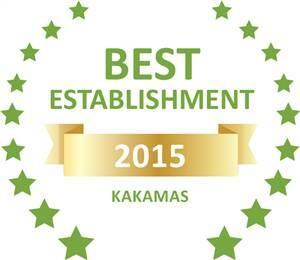 The central location also provides the ideal home base for our local region; whether being on a business trip or coming as a tourist to enjoy the variety of attractions and activities, in and around Kakamas. The Guest house adds a personal and exclusive interior touch to their 25 air conditioned rooms. Two self catering units on the premises are available if that will meet your preferable requirements. In all the rooms, Vergelegen, provides linen, towels, complimentary amenities, coffee- and tea making station. Vergelegen as an establishment is a WiFi hotspot. The hotel bouquet DTSV cannels are excisable in all the rooms. A Buffet style breakfast can be enjoyed in the restaurant or on the patio around the pool. All the rooms are non-smoking, but easy access to the patio if required. The establishment is also pet friendly with if possible prior arrangement, therefore some rooms has tiny court yards to accommodate our animal friends. Vergelegen restaurant has a well established reputation for abundant and quality served dishes. A celebration of local and international mouth watering choices, with a touch of ownership and playfulness in the recipes, will make the meal a memorable experience. The small but well thought through wine list, offers choices of local Kakamas and South African wines, that according to the owner, pairs magnificently with the dishes on the menu. A coffee shop by day and cocktail lounge by night, the ambiance of the communal lounge, plays the part, of the time of day, you choose to relax and take a little time out. Breakfast, tea time snacks and light lunches are available from the coffee shop. At sun set the cocktails served can just be the introduction to a feel good beginning to the evening spent at Vergelegen. 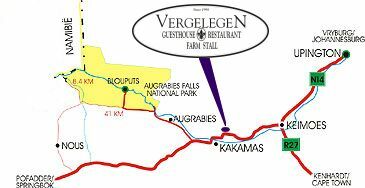 To name but a few must do, close to Vergelegen Guest House, worth visiting or experiencing will be: Augrabies Falls National Park, only a short drive away, a full day of sightseeing, 4x4 routes, walking trails and pre booked night drives. Riemvasmaak offers the famous hot Springs or 4x4 routes. Vine yard and wine cellar tours to farms that are diverting from the better known export grape and raisin industry. A town that was started in the late 1800; offers a couple of really interesting historical sites to see and visit. Numerous 4x4 routes can keep you occupied and driving skills well tested. A gentle rafting experience on the Orange river is always time well spend. You can even be spoilt by the company of fish eagles, to name but a few of the birds along the banks. Tranquil spots along the Orange river provide some decent fishing adventures. The adrenalin junkies can challenge themselves with some extraordinary mountain bike trails. King size bed or two Single beds. All rooms have air-conditioning and heating. Provided in the rooms are television with M-Net, some with bar fridges, coffee and tea facilities. All linen and towels, and complimentary amenity kit are provided. Additional services include: laundry services, private braai area and e-mail and fax facilities. Wake up calls and room service available. 24 Hour reception. Consist of two rooms next to each other with interleading door, both rooms are en suite and have private entrances leading to an patio with patio furniture. Consist of two en suite rooms with inter leading passage - 1x double bed and one single bed in the one room and 2x single beds in the other, both with private entrances which walk out on a covered patio. Full buffet breakfast included. Self Catering Luxury Studio Apartment - Consist of 3 bedrooms with two bathrooms, a fully equipped kitchen, dining area, lounge with TV,DVD/CD player, office and private courtyard with gas braai facilities. This was our first stay-over, the first visit having stopped for lunch. We were very impressed and the dinner that night was exceptional. Again, we will not hesitate to recommend Vergelegen to anyone asking about a place to stay in Kakamas. What an amazing stay! Kickback and relax in luxury. Amazing place and people. Well worth a visit. My wife and I thoroughly enjoyed our stay at Vergelegen. Our self catering unit was superb and everything in the unit worked well. Staff went beyond the call of duty to assist whenever possible and we appreciated their thoughtfulness. after a long trip from Johannesburg and while the service was excellent I suspect that we should have chosen the specials on the menu as these are local dishes. Very nice, secure upmarket air-conditioned accommodation. Friendly, informative staff attending to your needs. A very comfortable stay,all that we needed in one place : coffee shop, restaurant, pleasant surroundings.